Keen to get out for the day and enjoy the countryside? 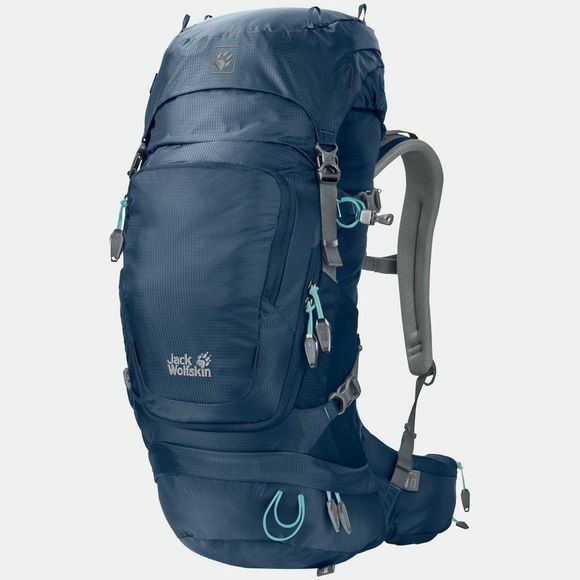 You can get everything you need for a day's hiking in the Womens Orbit 26 Rucksack from Jack Wolfskin and carry it all in comfort. When you're hiking on rough trails, steep paths or in warm summer weather, the Orbit packs provide the perfect combination of comfort, mobility and excellent ventilation. For better load control and carry comfort, the mesh panels of the ACS back system consists of different zones for stabilisation and ventilation. So the pack sits snugly on your back but air can still circulate freely. With the Orbit 26 you can keep your kit well organised. The main and base compartments have plenty of room for your fleece jacket etc. Small items fit nicely in the lid compartment or front pocket and there are practical zipped pockets on the waist belt for your energy bars and anything else you need to keep close to hand.